Kicker Billy Cundiff converted 80.8 percent of his attempts, but didn't have many game-winning opportunities. Spencer Lanning punted all season and was in the bottom portion of the league in punting net average, but did place 28 punts inside the 20. Editor’s note: Browns beat reporter Fred Greetham will break down the Browns roster on a position-by-position basis. This is the final part of the series looking at the specialists. Cundiff (6-1, 212,33) — Cundiff made 21-of-26 field goal attempts (80.8 pct.) on the season. He set the franchise record with 42 touchbacks (67.7 pct.) and made all 32 PATs. 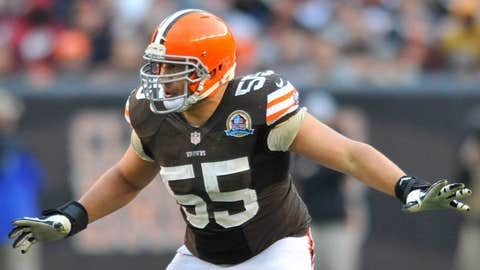 Cundiff led the Browns in scoring with 95 points. His longest field goal was from 51 yards. Cundiff was used as an emergency punter and had one punt for 34 yards when Lanning was injured during a game. 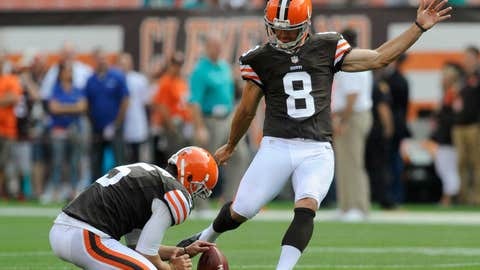 Cundiff ranked 30th in the NFL in scoring and was tied for 11th in the league in touchbacks. Lanning (5-11, 200, 25) — Lanning punted 84 times and had a 43.8 average, with a net average of 37.9. Lanning had five touchbacks and had 28 punts inside the 20. Lanning’s longest punt of the season was for 59 yards. He had one punt blocked. He was the AFC Special Teams Player of the Week for Week 3. In that game with the Vikings, Lanning threw a touchdown pass to Jordan Cameron on a fake punt in the win. He also kicked a PAT late in the game when Cundiff was injured. Lanning ranked 13th in the AFC and 26th in the NFL. Yount (6-1, 256,25) — Yount handled every snap on punts, field goals and points after touchdowns without a misfire. He had one special teams tackle. Bogotay (6-3, 207, 24) — Bogotay was brought in to compete to replace Phil Dawson but he injured his groin in August and ended up being placed on injured reserve. Summary: The front office didn’t seem to make having a kicker a high priority as they let Pro Bowl kicker Phil Dawson leave via free agency last year, as well as punter Reggie Hodges. They didn’t sign a kicker until they brought in free agents Shayne Graham and Bogotay to battle in the preseason. Neither was outstanding and both were injured in the preseason. Graham was released and Bogotay was placed on injured reserve. Cundiff was signed just before the first game and ended up kicking all season. He converted 80.8 percent, but didn’t have many game-winning opportunities. He attempted a 58-yard field goal on the game’s final play in the 27-26 loss to the Patriots. The kick was on target, but short. Lanning punted all season and was in the bottom portion of the league in punting net average, but did place 28 punts inside the 20. Yount didn’t make any noticeable mistakes snapping. The biggest area the special teams were hurt was in the return game. Travis Benjamin is a game changer in punt returns and had a 79-yard return for a touchdown, but was lost for the season with a torn ACL. By losing Josh Cribbs in the kick return game, the Browns rotated several players there and didn’t have a lot of success. Fozzy Whittaker was the most productive with an average of 21.0 per return, including a long return of 56 yards. Also, with the coverage units were made up of mostly players claimed off of waivers from other teams and the constant shuffling of the bottom of the roster made it difficult to get any continuity. Looking Ahead: It is unfair to for Cundiff to be compared to Dawson, but he did a serviceable job and didn’t cost the team any wins. If Chris Tabor stays on as special teams coach, it is likely Cundiff, Lanning and Yount would return. However, by keeping Bogotay on injured reserve, the Browns think he has potential. He likely will battle Cundiff in training camp. Benjamin should return next season, hopefully with his blazing speed and the young players on coverage teams should be more familiar and suited for their roles. Also, Dion Lewis should return and he was penciled in to the kick return game.